This week we celebrate the birth of a man whose life legacy can be summed up simply with the word sweet. The man who made milk chocolate his own was born September 13, 1857. It’s a story of success and one that didn’t come easy, but, for Milton S. Hershey, the hardships were part of the journey that led to the destination we now know as Chocolate Town, USA, Hershey Park, Hotel Hershey, Hershey Sports arena and of course, Hershey’s chocolate. 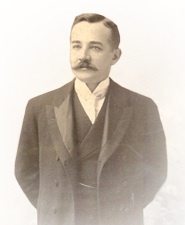 Born on a farm in Derry Township located in central Pennsylvania, Milton Snavely Hershey would become a shrewd business man but with a big heart who would put his chocolate fortune to good use. Not only would he have a chocolate bar named after him, he would become the founder of “the sweetest place on earth” and Hershey Industrial School for orphan boys. Hershey, however, was determined, ambitious and persistent. He was forty-eight years old when he opened his chocolate factory at 19 E. Chocolate Avenue in 1905. In the pursuit of happiness and success, Hershey was also extremely diligent and undeterred. Without a formal education and the ability to get through an apprenticeship (he was fired) that was made possible by his father, Hershey would go on to learn the basics of candy making. The knowledge he acquired led him to start a confectionery business. His endeavors would fail not once, but twice. Persistence did pay when he took a job working for a local confectioner in Denver, Colorado where he learned what would eventually be the future of his fortune: to use fresh milk when making caramels. Although his second business venture failed in 1886, Hershey returned to his home town of Lancaster broke, without his belongings but determined. Not ready to give up, Hershey worked hard to develop a caramel using fresh milk then marketing it as “Crystal A” guaranteeing a melt-in-your-mouth experience. A large order from a British candy importer gave Hershey reason to ask for a loan from the Lancaster National Bank to pay for raw materials needed to fill the order. The banker was so impressed by Hershey that he agreed to the loan, backing it with his own signature. Hershey would eventually discover then decide his future was with chocolate when he became fascinated by an exhibit featuring German chocolate-making machinery at the World’s Colombian Exposition in Chicago in 1893. He sold his Lancaster Caramel Company to competitors for $1 million in 1900 and began focusing on his quickly expanding chocolate-making business. 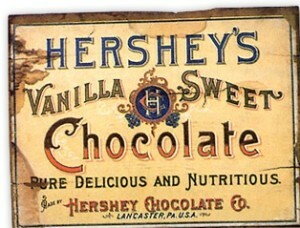 Hershey’s Milk Chocolate was first introduced in late 1900. 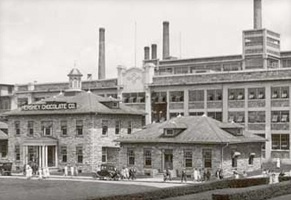 Hershey’s chocolate factory was opened in 1905 at 19 E Chocolate Avenue until operations were moved to the west side of town in 2012. Hershey built a town around his factory –a tree-line community donning silver replicas of Hershey’s kisses on street lamps complete with banks, shopping, and other amenities to benefit employees who chose to live near their work. Saddened because he and his wife didn’t have any children, Hershey founded the school for orphan boys now known as Milton Hershey School. With generosity and imagination, Hershey would create many jobs for workers who built the structures that would later become major tourist attractions. Hershey was also credited for having the ability to hire good people and he took great pride in his community. Now, through a mix of artifacts, interactive elements and educational information, visitors can see and feel what life was like as a chocolate worker inside the famous Hershey Chocolate Factory via The Hershey Story Museum located at 63 W. Chocolate Avenue in Hershey. 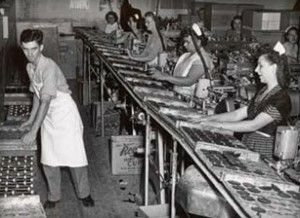 Severio DiMagno, of Hershey, was one of the original workers whose career spanned 19 years as a chocolate factory working in the department where chocolate was dipped. “His job was very physical,” she said, “but for extra money, he helped unload box cars filled with bags of sugar.” She explained those bags could weigh up to 500 pounds each. From roasting and refining to packing, weighing and order fulfillment, visitors can see what life was like when manual labor paid a mere penance — as little as 9 cents an hour. While the work was physical for both men and women, Mary Conkle, 88, of Annville, and Ercoli Divittore, 87, of Hershey, agreed their time working for Mr. Hershey was happy and an experience that’s left them with many good memories. Divittore was employed at the factory from 1944 until 1987, and Conkle worked from 1948 until 1955 on her first go-around. “I quit to have a baby,” said Conkle who returned, then retired in 1985. Conkle, a supervisor, worked the skids in the “knock-out” and wrapping department. Workers used a wooden mallet to gently release the cooled chocolate bars from molds, which were then wrapped. “I could wrap 140 bars a minute,” Conkle said. Male workers at the factory used to use bathtubs with wheels to transport liquefied chocolate to different areas of the factory. A full tub weighed as much as 1,000 pounds. Prior to the transport,“refining” occured — a process in which cocoa beans are stripped of their shells and ground into chocolate liquor. Artifacts on display include the knock-out hammer, the mallet used to remove the chocolate from molds, as well as a replica of the “bathtub trucks” used for transport chocolate until as late as 2012. Both Conkle and Divittore, co-workers who remain friends, said they have fond memories of their time working in the factory. And for the impending 157th birthdate of the man responsible, Chocolatetown will hold a birthday bash honoring the late Mr. Milton S. Hershey who died on October 13, 1945.